De Ponte Cellars Winery location is located in the heart of the Dundee Hills. Our tasting room is open 7 days a week from 11:00 AM to 5:00 PM. A tasting fee of $15 includes a sampling of 5 of our current releases. Our historic Carlton location is right off of Main Street next to the Carlton Bakery. We are thrilled to share the first release of the outstanding 2016 vintage with you… and what better way than with our annual case sale?! For the past 3 years, at least, it has been our job to properly proclaim the aptitude of these vintages - how to explain just how truly great they are without sounding trite or repetitive... but honestly, they are just THAT GOOD. If you enjoyed the 2014's and 2015's, the 2016 vintage is right up your alley. For wines coming from such a distinctly early and warm vintage, they perhaps have more nuance and complexity than one would expect. 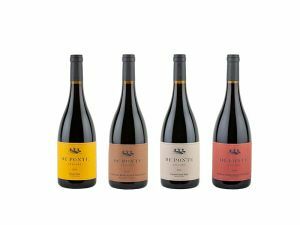 Also, all of the alcohols are moderate (under 14%, with the slight exception of the Lonesome Rock, but it carries it very well) - so they are true to the gorgeous De Ponte Pinots you have come to expect. Be the first to grab this vintage (all in their new packaging!) at the best price it will ever be offered at. Intense black cherry color in the glass; the nose has rich notes of raspberry and fresh spring flowers. Freshly baked berry pie mingles with a touch of vanilla on the palate, showing velvety texture and bright, balanced acidity. Absolutely delightful now or cellar 5-8 years. Medium garnet in color; the nose offers ripe fruit with an hint of minerality and floral notes. With medium body and lovely acidity, the palate carries flavors of black cherry and licorice. The steady, integrated tannins persist in a long finish that lifts the ripe, sweet fruit. This well-balanced wine will drink well now through 2023 and beyond. Intense depth in color; complex aromas of dark and spicy fruit mingle with a toasty minerality. The elegant palate shows pomegranate and red current wrapped with milk caramel. This wine, with its vibrant acidity and balanced tannin, has a seductive personality that will continue to show its many layers for another 8-10 years. Nose of smooth butterscotch, mocha and toffee mingles with notes of blackberry and plum. A luscious, concentrated body yields bright acidity and flavors of baking spice and peppercorn. This intricate and full bodied wine is serious and wonderful with a lingering finish. Enjoy on that special occasion or cellar for 10-12 years. Orders of 24 bottles of more are eligible for FREE GROUND SHIPPING. Cases may be mixed, but only with wines listed above. If the invoice does not look correct, do not worry, we manually input and charge the orders, so the proper corrections will be made. *Due to low temperatures across the country, ground shipping may be held until above freezing. Expedited shipping can also be arranged. *This offer is only valid on case purchases of 750 ml bottles and for the wines listed in this email. Sorry - the Clay Hill is already a killer deal! Location: All Month Long !!! 17545 Archery Summit Road | Dayton, OR 97114 | (503) 864-3698 | Copyright © De Ponte Cellars. All Rights Reserved.